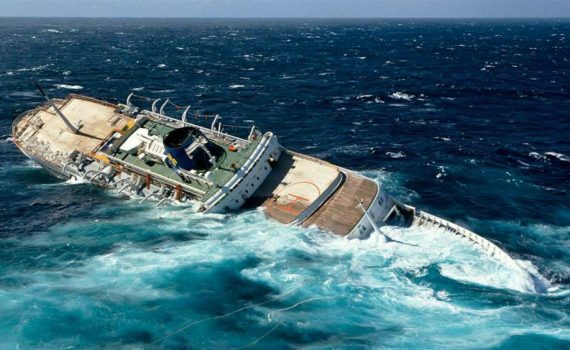 The tragedy of the MS Oceanos can be regarded as one of the finest hours for the South African Navy and South African Air Force, and is regarded as one of the greatest maritime rescues ever undertaken. Not only was every soul saved, the South African Navy and South African Air Force personnel conducted themselves in great regard with a number of medals awarded for bravery, and even a Honoris Crux Gold awarded to Able Seaman Paul Burger Whiley (one of only six ever awarded). On 3 August 1991, the Oceanos set out from East London heading to Durban. Unwittingly she headed into highly dangerous sea conditions with 40-knot winds and 9 m swells. At approximately 21:30 while off the Wild Coast, a muffled explosion was heard and the Oceanos lost her power following a leak in the engine room’s sea chest , the ship was left adrift and then started to sink. The crew at this stage did not conduct themselves with great decorum and reports indicated that they were quite prepared to save themselves and abandon the passengers. Nearby vessels responded to the ship’s SOS and were the first to provide assistance. The South African Navy along with the South African Air Force launched a seven-hour mission in which 16 helicopters were used to airlift the passengers and crew to a site south of Coffee Bay. Of the 16 rescue helicopters, 13 were South African Air Force Pumas, nine of which hoisted 225 passengers off the deck of the sinking ship. All 571 people on board were saved. Of the many awards and citations of bravery awarded to South African military personnel for this phenomenal rescue, one stands out. Able Seaman AB Wiley from the SAS Scorpion was presented with the Honoris Crux Gold Decoration by the then Minister of Defence, Mr R.P. Meyer on the 6 March 1992. He was cited as the first diver to be lowered aboard the MV Oceanos, and although he was severely beaten against the ship’s superstructure, he reached the deck. Under extremely trying conditions he then succeeded in creating order and stability among the passengers. He then started hoisting passengers, on the first lift he accompanied a survivor up to the helicopter, after which it took a further 10 minutes of nerve-racking hovering to get him back on the deck. During this maneuver, after being severely battered against the railing of the ship he was flung out of the hoisting strap and fell to a deck lower than intended. Thereupon a male survivor also fell out of a hoisting strap and fell 40 meters into the mountainous swells. AB Whiley, disregarding his own life, dived into the treacherous seas and on reaching the semi-conscious passenger, revived him and assisted him into a rescue craft. Not quite finished Able Seaman Whiley then swam back to the sinking ship and was confronted with the further difficulty of climbing back on board. Whilst scaling a ladder draped over the ship’s side, he was repeatedly beaten against the ship’s hull. However, his perseverance paid off and he managed to return to the deck to continue his vital task. After six hours aboard the Oceanos Able Seaman Whiley was one of the last persons to be hoisted from the stricken vessel.